Ingredient Name: Kabocha. 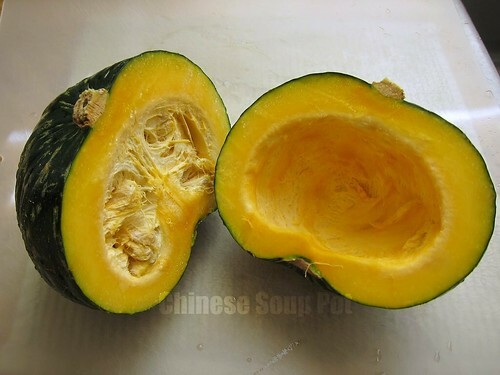 Also called Japanese Pumpkin. Kabocha pumpkin is a small Japanese variety of winter squash, usually weighing 2 – 3 lbs each. It is sweeter than a butternut squash, and has a texture and flavor of a pumpkin and sweet potato combined. Kabocha pumpkin is commonly used in Asia where a pumpkin, potato, or other squash would be used in a recipe. It is also a common ingredient in Asian soups and vegetable tempura. The pumpkin is available all year round but is especially good in late summer and early fall. Rich in vitamin C, beta carotene, iron, and potassium. Contains small amounts of calcium, folic acid, and minute traces of B vitamins. See a list of soup recipes using kabocha pumpkins. Rinse the outside of the kabocha pumpkin before cutting off the hard tough skin with a knife. Cut the pumpkin lengthwise in half. Use a spoon to scoop out the seeds. Available in Asian grocery stores, and sometimes in larger non-Asian grocery supermarkets. How do you enjoy your Kabocha pumpkins? Leave a comment below to share your ideas.